This is both a review of a book that will give you much more information than I intend to, as well as a brief synopsis of what I am doing with my portable pens. I hope you enjoy it, and feel free to leave comments and thoughts on your own experiences, or what you hope to do. Based on the title, you may wonder whatever possessed me to put this in a gardening article. Well, the second part of the title is why – healthy soil. This book is loaded with ideas on how to improve your garden and soil in a more natural and less labor intensive way, as well as how to encourage chickens to do it for you. It also has lots of other odd bits of advice, such as to avoid fluoride treatments, as fluoride is a byproduct of several industrial processes, and they put in toothpaste as a means of getting rid of it and making a profit. So, even if you do not have chickens, you will find lots of information in this book of benefit to the home gardener and small farmer. 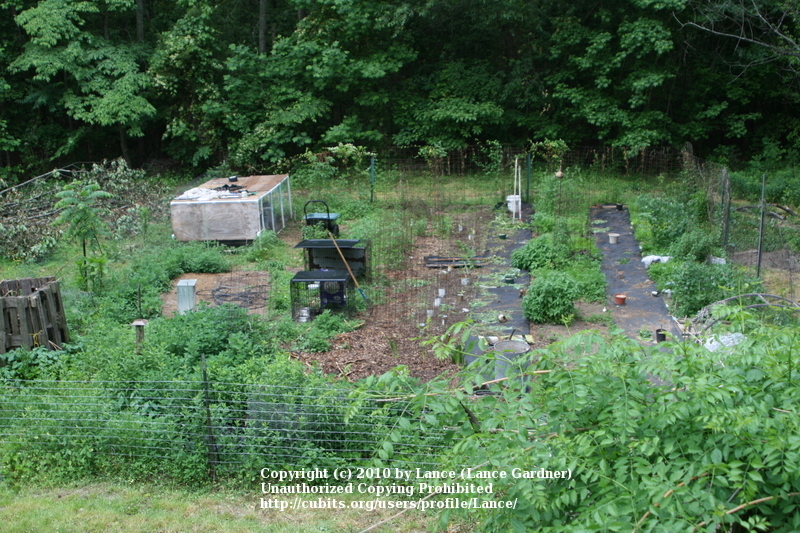 The photo to the right shows 2 smaller bunny pens with one bunny in each, and the larger chicken pen, which also has 2 bunnies in it, which will stay in that corner of the garden. The 2 smaller pens will get moved to the more overgrown sections soon, and turn those weeds into fertilizer fairly quickly. I currently have 4 portable pens, one for chickens and 3 for bunnies, which get moved around to mow the lawn and clean up the vegetable garden. The eggs from these chickens are much more flavorful and with more richly colored yolks than other eggs – and are supposed to have more nutrition such as the beneficial omega fatty acids – than chickens fed a processed food diet. The bugs, worms, and greenery they eat add a lot to their eggs. If you are interested in getting started with one of these, I can help you with some ideas and let you know what I did. 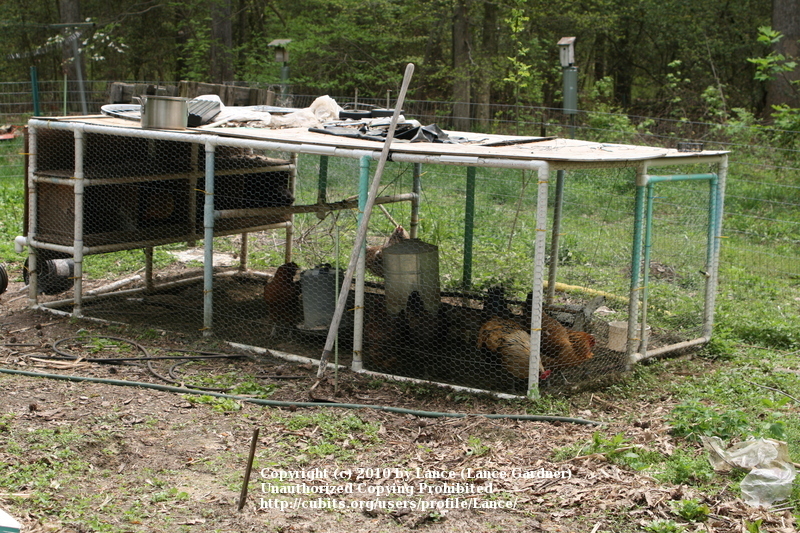 The photo to the left shows more of a close up of the chicken pen. 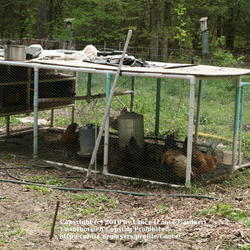 Note that everything is hanging or attached so it can be easily moved, including the nesting boxes, feeder, and water. Unfortunately, I am not able to move these around as I had originally hoped, as my squirrel chasers (2 dogs) find the processed food bits to be irresistible dog treats – yuck!! 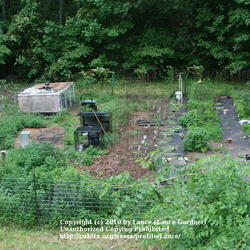 So, I now move it around where the dogs do not have ready access to it, which is in the veggie garden. The chicken pen is currently parked in a corner of the veggie garden so I can toss in weeds, bugs, and scraps. The roots of many of the garden plants will also be able to obtain the nutrients from this area. At the end of the season, I will start moving it around again to help clean up the garden. The bunnies are in smaller pens, so I am moving them around to help with the weeding – they are very good at eating a large variety of plants, which is also why they are contained. So what are some of the ideas for gardening? One big one is to avoid tilling or turning the soil, as this exposes weed seeds and destroys the structure of the soil. Instead, build the soil from the top down. The chickens will dig and scratch like crazy, working the top few inches of soil and eating lots of seeds and bugs. Without chickens, the idea is still sound, as research is showing that adding layers of organic matter on top of the soil will help what is underneath, as well, and no-till methods are becoming more popular. Having your soil covered will also help ensure it does not get blown or washed away, and adding organic matter (chicken poop included or not) is beneficial to almost any soil type. There are also sections on getting super fertile soil and earthworms as indicators. Other ideas include the benefits of seaweed both for the chickens and for the garden, permaculture gardening, deep mulching, rotational garden systems, using compost and how much organic matter to add, and the benefits of additives such as diatomaceous earth and duckweed, although the last two are more for the chickens and their soil additions than the garden directly. So, if you want to read something a bit more unusual, give this book a try. And as a benefit, the author attempts to add some humor into what could otherwise be a very messy subject.